There is a big storm coming up the East Coast. Because of this I had a crazy day! Plan "A" was to pick up our son at college, drive to Pennsylvania and spend the night and return to Boston tomorrow. After tracking the storm on the internet, we moved to Plan "B," driving to PA to have dinner with Dad and then returning to my sister's home in New Jersey to keep ahead of the storm. We'll leave first thing tomorrow and, if all goes well, will get back home before any serious snow starts falling - wish us luck! So most of my day was spent driving, packing, driving, visiting and driving again. There was terrible traffic on each trip on the New Jersey turnpike - and there isn't even any snow yet! We had a nice visit with Dad even though it was not the overnight we had planned. 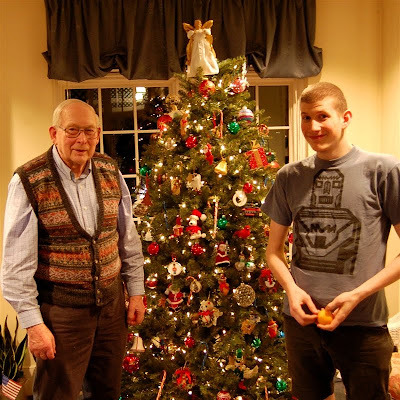 This tree is in the lounge area in his retirement community and all of the residents added ornaments to decorate it. The John Deere tractor in the first photo is my Dad's. He farmed for many years and then sold farm equipment for many more and he has quite a collection of John Deere tractor models (I guess those collecting instincts of mine are inherited!). We did actually do a quick little project in the few hours we were there. 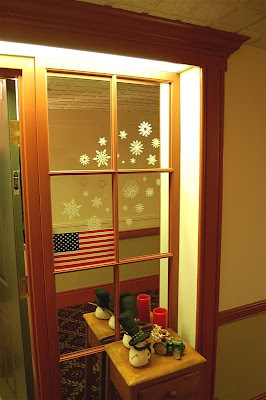 I brought along my baby bug (Personal Cricut) and used it to cut some of the When It's Cold Outside snowflakes. (If you missed my earlier post about this great mini cartridge here is a LINK). We used white vinyl and quickly realized that it was a good idea to do the less intricate flakes and the shadow versions. The others cut well but it is really messy trying to get all of the little detail bits separated when you are using sticky vinyl! 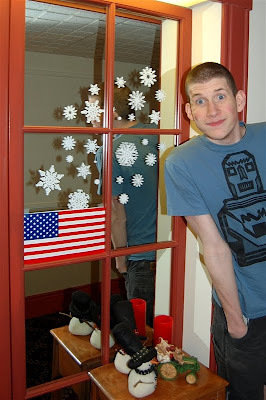 We put them on the mirrored "window" by the door to his apartment. The idea was to make it look like they were blowing down from the top right corner. This photo was taken with a flash and it is interesting to see the deep shadow effect produced in the mirror. There are also some odd reflections - my son does not have splotches on his face in real life! He does have a new and super short haircut. 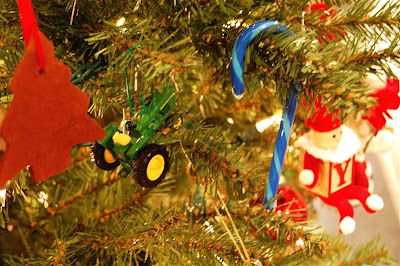 If you look closely, you can see Santa driving a John Deere tractor on the table. Sorry for the quick post - I hope all your holiday preparations are going well! Have a safe trip back home Diane!! My dh and I are flying back to NJ on Monday...I'm hoping there won't be any snow while we're there. Oh how cute!!! Love the photos of your Dad & Son! Your snowflakes are just adorable! My prayers & thoughts are with you for a safe trip home!! I will say, I'm glad my Daughter has decided to attend the local University here next year, so no driving for me yet! (She wants to transfer after 2 years). Have a safe trip home. I hope you beat the snow. Love the picture of your son and your dad. So smart of you to take your little cricut. Cute cute snowflakes. So glad you got to spend time with your dad, even with the lousy weather! I live in Delaware, we havent left the house all day. Glad you got your son and are headed home safely! Travel safe. How very special to spend some time with your dad. Love the way you brought some cheerful snowflakes into his world. Enjoy a wonderful holiday. How very awesome! Your dad looks very happy! Handsome son!